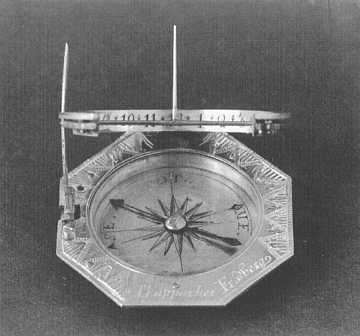 Equatorial sundial of 1780, made in the city of Friedberg, Bavaria, Germany. Now in the local museum. The pole bar on the hour ring is turned down in the winter and up in the summer. The hour ring is turned up to the local elevation on the pole height quadrant (left), according to a table listing towns in Europe. The whole dial is turned horizontally to the right azimuth using the built-in compass. Our network time service and this accompanying web site are up and running since May 1998. The old servers have been retired in May 2012 after being on 24/7 duty for 14 years. Since January 2012 there are three modern new servers. Hopefully they will have a just as long operational life as the old ones. Simple time servers are offered in the campus network of Augsburg University of Applied Sciences. (How would you call 'Fachhochschule' in English?) They are accessible from the Internet on request. Please see the page Usage for details. The Network Time Protocol NTP version 4 and the Simple Network Time Protocol SNTP are supported in server mode. Peering with other stratum-2 (buddy) servers is possible on request. There is a campus broadcast service, but no multicast service. As an external user, please consider using a geographically close NTP Pool Time Server since that will be sufficient in most cases and is easier for you. pool.ntp.org is a project to provide a 'public NTP time server for everyone'. It's idea is load balancing over the most used time servers. Our servers are pooled too, so you will use them anyway. The servers are infrequently yet sometimes off-line for maintenance and upgrade. Forced to this level because we have only limited quality of service when our Internet connection is congested. These addresses are not likely to be changed in the future. This location is not likely to be changed in the future. You may yourself assess the performance of our NTP servers. Look at the actual status of server references and display statistics diagrams of the local clock loop and the external server connections. Go to the NTP subnet page or to the site map to choose. In no event will Hochschule Augsburg be liable for any direct, indirect or other consequential damages resulting from the use or an interruption of this service. See also our page on legal information. The structure of our NTP subnet. The NTP protocol and software. The 'Time' as a topic. For questions or comments feel free to contact the operator of this service, The Computing Center. This site has no frames now and is mostly accessible by the menu on the left margin, but you may as well use the navigation bar on top and bottom of every page or the site map. See also our viewing hints.